I love browsing through all the different crafters on Etsy and marveling at the creativity of some of those people. I’ve always considered myself a creative person, but I have severe limits when it comes to creating something that people would want to buy. Every day, Etsy will feature random products on its main page, and I frequently find interesting products through that method alone. Today, I discovered YAVA glass from Sedona, AZ. 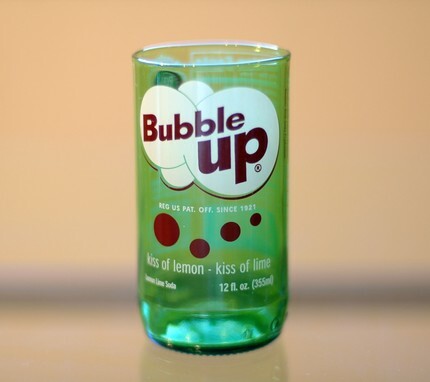 What originally caught my eye was a Bubble Up soda pop bottle that had been recycled into a drinking glass. When you take a look at their shop, however, they have glasses made from all sorts of bottles. In addition to the drinking glasses, they make coasters, spoon rests, and even jewelry out of the bottles. A set of the drinking glasses costs around $30, and I’m thinking some of the beer bottles would make for unique barware. Support those creative souls over at Etsy, will ya? wow, these are great! thanks for featuring them!